He spent several years under house arrest and then in forced labor. He was appointed coadjutor bishop of Hanzhong, when his brother, Msgr. Bartolomeo Yu, was arrested in 1989. Hit by a stroke, he retired, also to safeguard the new found unity of the diocese between official and underground. Hanzhong (AsiaNews) - Msgr. Matthias Yu Chengxin, bishop coadjutor emeritus of Hanzhong (Shaanxi) died on December 7th at the age of 90. 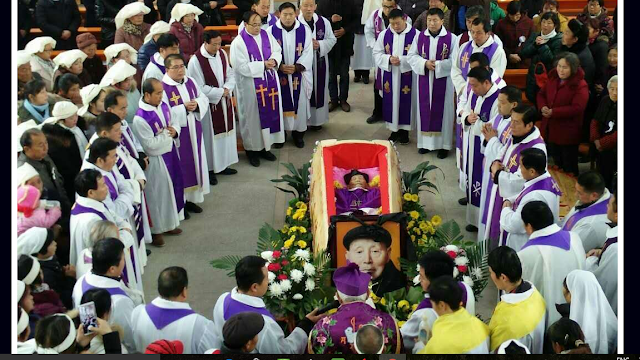 His funeral was celebrated yesterday in the church of Xiaozhai (county of Chengguo), coinciding with the 28th anniversary of the episcopal ordination of the deceased. Msgr. Louis Yu Runchen, official bishop of Hanzhong presided over the funeral ceremony. Msgr. Matthias Yu Chengxin was an underground bishop, not recognized by the government. For this reason, his episcopal title was mentioned only during the funeral service, but not written on any notice or sign during the funeral mass, concelebrated by 31 priests, most of the diocese. According to local Catholic sources, this silence was not due to particular pressures from the civil authorities. In the funeral service, Msgr. Louis Yu defined the deceased as "monsignor". Mathias Yu was born into a Catholic family on December 27, 1927. He is the younger brother of Msgr. Bartholomew Yu, also Bishop of Hanzhong, who died in 2009. One of their sisters, Yu Rongjie, still living, is a nun. All three Yu bishops were approved by the Holy See, but only Louis Yu is recognized by the government. Bishop Matthias studied at the Hanzhong seminary in 1950 and entered the regional seminary of Kaifeng (Henan) in 1956, but the seminary was closed two years later by the Three Self-Reform movement [for the building of a national Church autonomous from the Holy See - ed.). During the Cultural Revolution (1966-1976) he was first subjected to house arrest, then sent to a forced labor camp ("reform through work"). In 1980, after the opening of Deng Xiaoping and the resumption of religious life, he was ordained a priest and placed as spiritual director and teacher of Latin in the underground seminary of St. Joseph in Hanzhong. He is remembered as a jovial person, who toured the parishes on his bicycle to administer the sacraments to his faithful. Msgr. Matthias was ordained bishop secretly in 1989. An eulogy read during the funeral service and signed by all the priests of Hanzhong, states that "he never exercised his episcopal ministry and never allowed others to call him bishop, nor did he ever appear with the episcopal insignia, in private or in public. He has always considered himself and has always served the Church as a priest ". Some faithful say that the deceased bishop was an "auxiliary bishop" and not "coadjutor". The different opinions and statements reflect the difficult history of the diocese, long divided between official and underground. Msgr. Matthias Yu was secretly ordained as coadjutor bishop of Hanzhong by Msgr. Li Zhenrong of Xianxian on December 12, 1989, after his brother, Msgr. Bartholomew Yu Chengti, unofficial bishop of Hanzhong, was arrested in November of the same year, during a heavy repression against underground communities throughout China: the authorities had discovered that underground bishops had secretly gathered as an "episcopal conference" , in the so-called "Sanyuan meeting". An authoritative ecclesial source spoke to AsiaNews about the mighty efforts of Msgr. Anthony Li Duan, official bishop of Xian (Shaanxi), to push his dear friend, Msgr. Bartholomew Yu, to rebuild communion in the diocese in 2000. In 2005, shortly before the death of John Paul II, there was a turning point in the life of the diocese of Hanzhong: Msgr. Louis Yu asked to be reconciled with the Pope and the Holy See. The funeral mass for the Polish pope was also a ceremony of reconciliation because for the first time in decades Msgr. Bartholomew and Msgr. Louis celebrated the Eucharist together. Until his death, Msgr. Bartholomew was the ordinary of the diocese; in 2009, at his death, Msgr. LouisYu succeeded him in leading Hanzhong. The authoritative source states that "in a diocesan meeting, Msgr. Matthias has taken the initiative to retire and not to assert his episcopal status for love of communion in the diocese ". On the other hand, in 2007 Msgr. Matthias was hit by a stroke that created mobility problems. When Msgr. Bartholomew died, Msgr. Matthias was paralyzed and could not take care of himself and the diocese. The eulogy read during the funeral service says that Msgr. Matthias "knew his abilities and the reality of the diocese well. He offered his sufferings, going against the expectations of some, but fulfilling the will of God ". In this year 2017 nine bishops have died in the Church in China. In four of the dioceses concerned, the Chinese government has not yet allowed the ordination of the candidate bishops successors appointed by the Vatican, or has not recognized the successors secretly ordained in the past without government approval. This is creating even greater difficulties in the dialogue between China and the Holy See, which is precisely aimed at solving the thorny problem of the appointment of bishops.